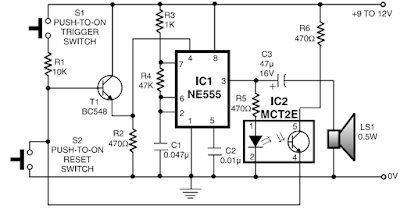 The latch-up alarm described here is based on single IC NE555, configured as an astable multivibrator. The timing components are selected such that the oscillation frequency of the multivibrator lies within the audio range. 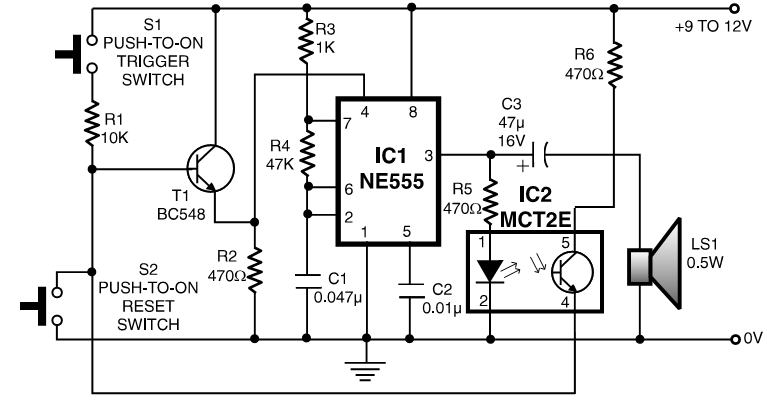 Instead of a flip-flop stage, an opto-coupler (MCT2E) is used for latching of the alarm. Under normal condition, pin 4 of IC1 is pulled to ground via resistor R2, and its output at pin 3 is held ‘low’. When switch S1 is pressed momentarily, transistor T1 conducts to bring reset pin 4 of 555 to logic ‘high’. As a result, IC1 is activated and the alarm starts to sound. Simultaneously, the LED inside opto-coupler glows and the phototransistor conducts. As a result, trigger transistor T1 gets base bias via phototransistor and resistor R6. The alarm sounds continuously until reset switch S2 is pressed. When switch S2 is pressed, transistor T1 is switched ‘off’ to bring pin 4 of IC1 to logic ‘low’ and the alarm is disabled.